Last year, celebrity chef and cruise ship host Paula Deen told Matt Lauer she had “learned so much” after being called out for the racist remarks she’s made in the past. But it’s apparently taken her less than a year to forget those lessons, because today she tweeted this #TransformationTuesday photo of her and her son Bobby dressed as Lucille Ball and Desi Arnaz. 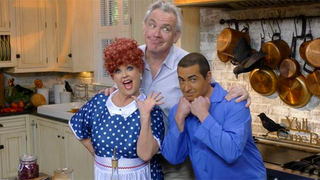 Paula’s transformation consisted of a bright red wig and polka dot dress, but Bobby took a more subtle approach: brownface! Have fun at Motherboy, y’all! Have fun esplainin’ your costumes!